Yamaha has a problem of plenty with the new Yamaha MT-15 joining the ranks. 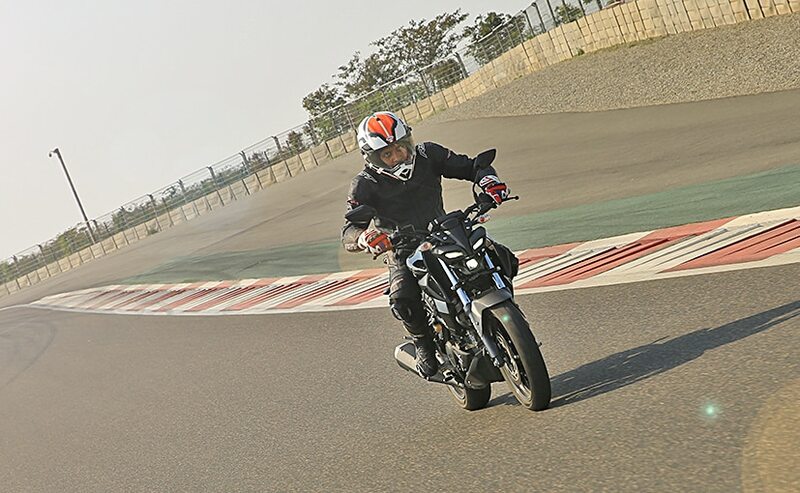 Based on the Yamaha YZF-R15, we spent some time with the new MT-15 at the Buddh International Circuit to see what exactly it offers. 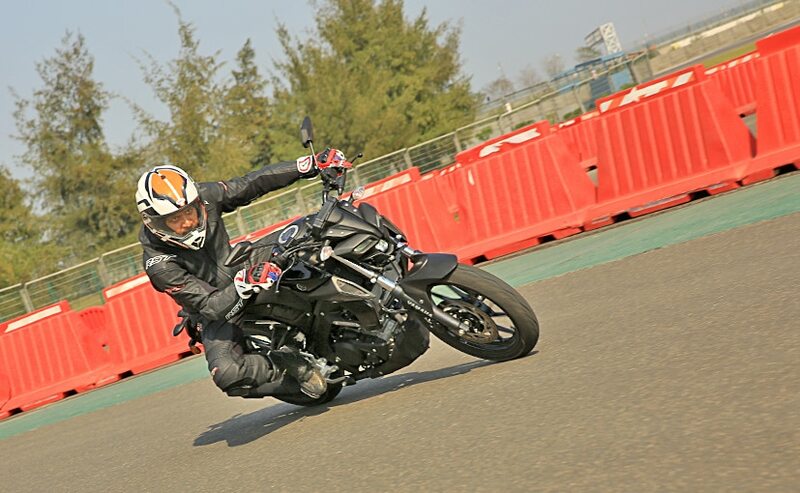 The Yamaha MT-15 is the newest 155 cc streetfighter from Yamaha India. Targeted at the millennial crowd, the MT-15 promises a stylish, muscular naked, and shares its DNA with the popular Yamaha YZF-R15. So, it has the same engine, chassis, and many common features with the R15, but it looks completely different. Of course, for India, the MT-15 has lost some components, like the upside down forks on the international-spec model, or even the aluminium swingarm of the India-spec R15 V3.0. But at ₹ 1.36 lakh (ex-showroom), it's only ₹ 3,000 less expensive than the R15 V3.0. Does it justify the price tag, and will it be as popular as the R15? 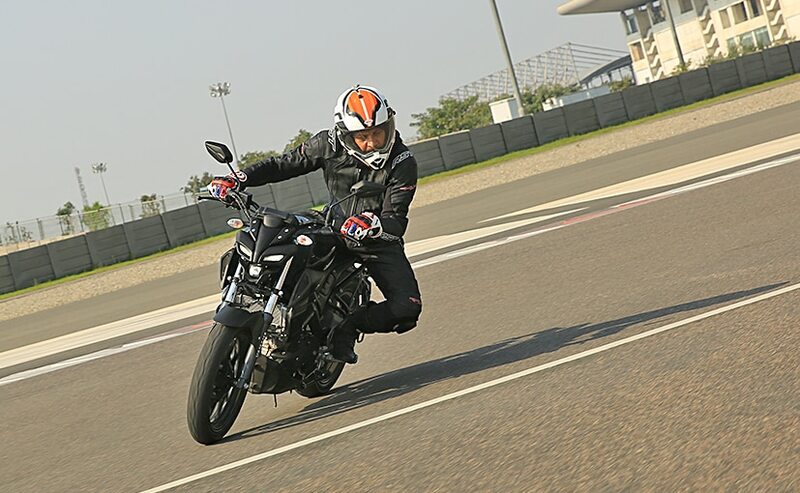 We spent some time hustling the new Yamaha MT-15 around the Buddh International Circuit (BIC) to seek some answers. First, let's talk about the looks; and they are subjective after all. What's beautiful to some, may not be for others. That's more or less what the case with the MT-15. It may not be good-looking in the conventional sense, but presence it certainly has. The futuristic and aggressive front end is accentuated by the twin slot daytime running lights (DRLs), between which sits the LED headlight, giving the MT-15 an almost robotic, Transformers-like face. It's a love-it, hate-it sort of design, but something which will definitely grab your, and anyone else's attention. The sculpted fuel tank, extended radiator shrouds, and a plastic belly pan complete the muscular look. The rear end is proportionate and sleek, with a nice LED taillight finishing up the tail section neatly. 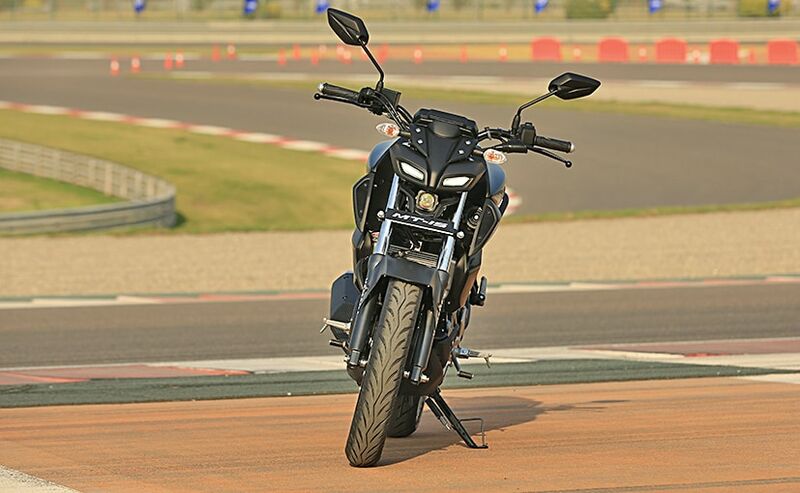 If it's one angle from which the MT-15 looks best, at least to my eyes, it will be from the rear three-quarters. The instrument panel is a straight lift from the R15, and as mentioned before, for India, the MT-15 loses out on some equipment. So, no USD forks, and the wheels are shared with the R15 and it only gets single-channel ABS, unlike the dual-channel ABS the R15 now gets. But the MT-15's looks begins to grow on you, and it definitely looks sharp, and will stand out on the streets. So, that's a good thing; if it's road presence you're looking for, the MT-15 has it covered, in plenty. But a good looking streetfighter is one thing, and having the performance and handling to back it is another. So, how does it ride then? Swing a leg over it, and it's immediately a happy place to be in. The flat handlebar, upright riding position with the somewhat sporty stance is instantly likeable. City-slickers, and college-going millennials will welcome the comfortable, yet sporty ergonomics. The engine purrs into life with a familiar thrum; after all it's the same R15 mill, as well as the exhaust. The 155 cc, single-cylinder, liquid-cooled engine puts out 19 bhp of maximum power at 10,000 rpm and 14.7 Nm of peak torque kicking in at 8,500 rpm. And it gets the same 6-speed gearbox as the R15 and standard slipper clutch. What is different though is the final drive ratio, to make the MT-15 get some more pulling power at low and mid revs for better tractability while husting through traffic and from stop light to stop light. Yamaha says the MT-15 accelerates faster than the R15 in the 0 to 80 kmph sprint, but loses out on top-end performance. Official figures put the R15's maximum speed at 129 kmph, while the MT-15's top speed is rated at 118 kmph. But with a kerb weight of 138 kg, the MT-15 is a good 4 kg lighter than the R15, and getting up to a decent clip is brisk, and quite entertaining. The BIC is no place for a 155 cc motorcycle, but thankfully we were testing the MT-15 around the short southern loop, leaving the back straight and the main straight out of the equation. Around the corners, it dips in and out with precision and eagerness, and its taut and stable road manners promises to be impressive even while filtering through traffic on the daily commute. But show it a long enough stretch of road, and that's when you'll possibly begin to yearn for a little more punch, some more stamina. If you're looking for highway duties, the MT-15 may lack the stamina to cover long distances at a decent clip, but we'll reserve our judgement till we get to ride and test it out in real world conditions. Priced at ₹ 1.36 lakh (ex-showroom), the Yamaha MT-15 is pricey, for a 155 cc naked. 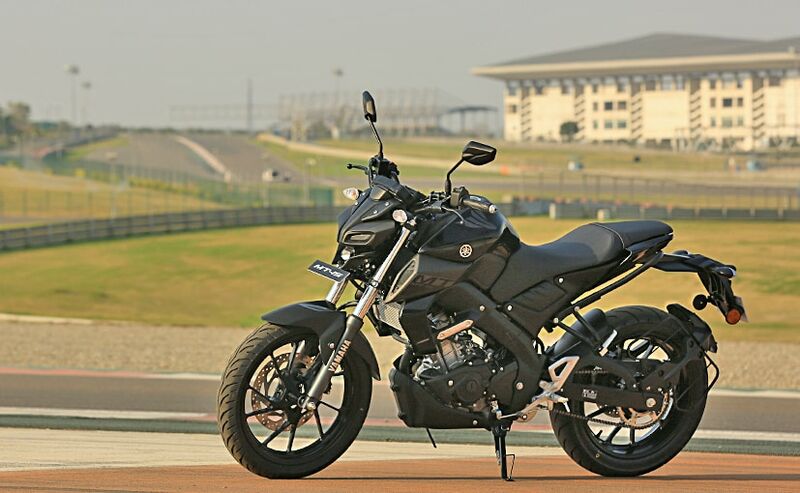 The Yamaha MT-15 looks good, has a smooth and refined engine, and is a taut handler. There's nothing much to complain about the MT-15 as a product. 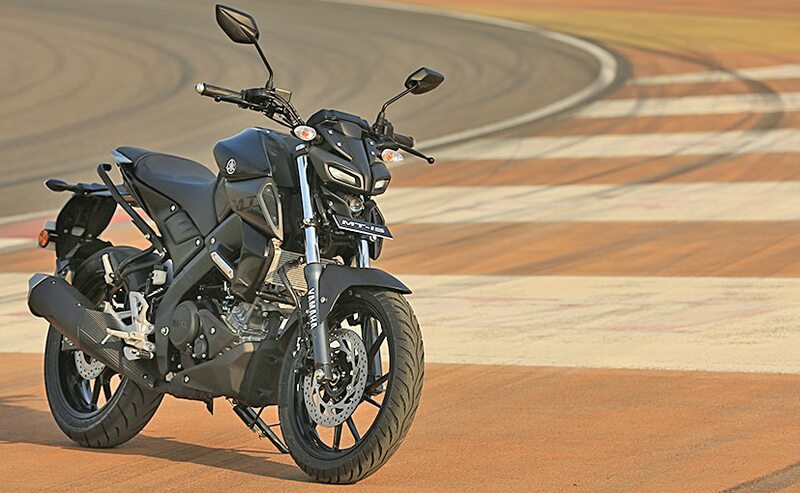 But what Yamaha India has is a problem of plenty, and the price tag the MT-15 carries. At ₹ 1.36 lakh (ex-showroom), it's certainly not affordable, more so, as a 155 cc naked. At ₹ 3,000 more, you get the full-faired, R15, with dual-channel ABS and a higher top speed, but more importantly, at around ₹ 3,000 less than the MT-15, you also get the Yamaha FZ-25, with a bigger and more powerful 250 cc engine, which offers more performance and better cruising ability. The Yamaha MT-15 is quite a likeable motorcycle, and could be the perfect motorcycle in that segment, if budget is not a constraint. And if you're not just looking at the Yamaha family, at that price bracket, there are other 200 cc motorcycles as well, like the TVS Apache RTR 200 4V, and the Bajaj Pulsar NS 200 which are considerably less expensive. So, will millennials be willing to spend that kind of money on the Yamaha MT-15, and more importantly, for Yamaha India, will the MT-15 be able to replicate the commercial success of the R15? 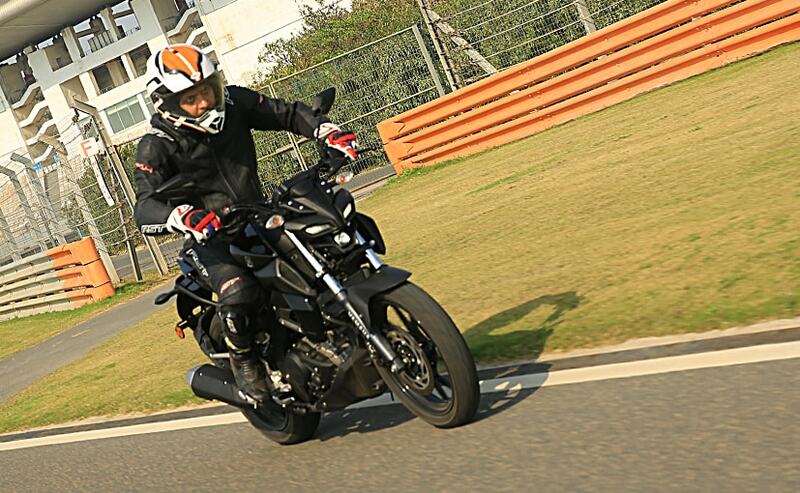 An afternoon outing at the Buddh International Circuit with the MT-15 was quite enjoyable, but out in the real world, does it make for a practical decision to spend that kind of money? Right now, we don't have an answer to that, and rationale says, do your research, buy the less expensive option and use the extra you have on riding gear. But then, motorcycles are like teenage love affairs - rationale and practicality seldom take priority. So, go on, take a test ride, you may well end up taking the Yamaha MT-15 home with you.